The classic and iconic shape of the Volkswagen Beetle needs no introduction, surprisingly practical yet fun. This 3 door legend comes in a variety of versions from the entry level to sport Dune version. Available in both petrol and diesel versions too with standard version returning up to 65.7mpg. Boot space is ample with up to 310 litres of space available. The build quality and economical engines combined with stylish design make for a great package. Based on the previous Golf this means you can be sure of safety and reliability scoring the maximum 5-star safety rating. The Limited Edition Turbo Black and Dune offer something extra in terms of looks and performance with eye catching design and extras to compliment the unique Beetle look. The entry level 1.2 litre 104bhp provides a very punchy performance. The range topping 197bhp 2 litre petrol version can rival any hot hatch. Sat Nav and a large sunroof can be added as an extra amongst other additions. Air conditioning and DAB come as standard on all models as well as remote central locking. The interior is well laid out and practical allowing the driver to concentrate on the task in hand. 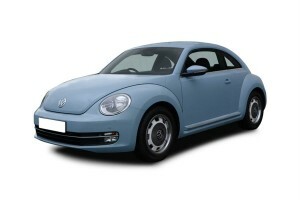 Coast2Coast Cars has access to a range of offers for the Volkswagen Beetle for any spec and any model. Don ‘t pay list price if you use our online offers quote system you could save £1,000’s. It couldn’t be easier, simply fill in the form, choose your spec and view the final price.